This is my farewell homily to the two Church of England congragations of St Ives, delivered on 3rd May 2015. But what is this parcel? 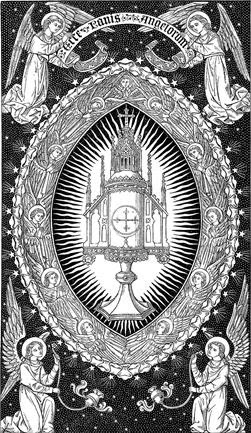 To put it bluntly, it is faith; not any faith in whatever moves my feelings, but the Catholic faith of the Church with its established liturgical practice and its deep longing to find fulfilment in the beatific vision of God one day in heaven. Of course, faith is something to be lived out each day through works of love and service for one another – as our reading from the First Letter of John warns us saying, ‘Those who say, “I love God,” and hate their brothers or sisters, are liars’ (1John 4:20), so through faith we ought to love each other. Yet, faith is something that should be also cherished, enjoyed, felt, and importantly passed on, shared, with others. Over the last four years, I hope I tried my best to pass on this parcel of faith to and with you. Those of you who have kept me company at the study groups will know that the minimum set boundaries for this faith have been the words of the Creed; while those of you who have patiently endured my sermons, will know that I have often talked about discipleship, about being followers of Jesus with a specific vocation, and more generally about living the Christian life – these are all manifestations of our faith “in action”. So let us look again briefly at the three main points I have passed on to you as part of the parcel of faith. The first one is imitating Jesus. As I say this, I am conscious that my first ever address to you four years ago was about the Sacred Heart of Jesus, and Jesus himself says of that heart, ‘Learn from me; for I am gentle and humble in heart’ (Matthew 11:29). Imitating Jesus is the best we can do in life – not in the sense of monotonously asking ourselves “What would Jesus do?” rather coming to imitate his gentleness and humility as the natural consequence of having spent time with him in prayer and meditation; like you would come to imitate and resemble a good friend because you spend far too much time with him. May you find grace and constancy to grow into the likeness of Jesus. 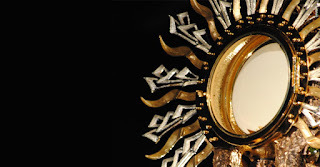 The second point is the centrality of the Eucharist; the importance of recognising Our Lord present in the Blessed Sacrament as the real and objective presence of Jesus who said ‘I am with you always to the end of the age’ (Matthew 28:20) – the presence of One who constantly longs for us infinitely more than we ever long for him. May the eyes of your faith be opened to the mystery of God-with-us, of Jesus in the Eucharist. 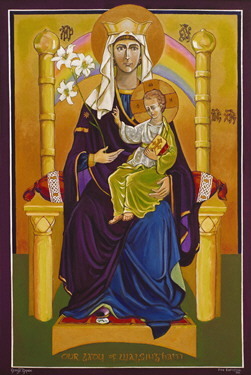 The third point is devotion to the Blessed Virgin Mary, who is Mother of God and of all Christians – even of those Christians who find her a silly addition to the faith. Many times I have preached about Our Lady and even more times, I have brought your prayers to God with her. May you grow in devotion towards our mother, and take courage from her example of faith and her intercession. Finally, brothers and sisters, farewell. Put all things in order, listen to my appeal, agree with one another, live in peace; and the God of love and peace will be with you… The grace of the Lord Jesus Christ, the love of God, and the communion of the Holy Spirit be with all of you.